Hello, just a brief update to remind people in England about Tim Kendall's public lecture on "Sylvia Plath in Devon" next week on 1 June. Read more about it in the original post from a few weeks back. If anyone who reads this blog attends, I am sure we would all love an review/synopsis. Sylvia Plath graduated Smith College with honors in June 1955. She had spent her senior year working on a special honors thesis which she titled: "The Magic Mirror: A Study of the Double in Two of Dostoevsky's Novels." Her originally submitted typescript is held by the Mortimer Rare Book Room at Smith College (a microfilm copy also exists). Additionally, a typescript carbon of the work, as well as her notes and note cards, are held in the "Smith College Memorabilia" (Box 11) of Plath mss. II at the Lilly Library, Indiana University (a list of Plath's archival collections, with links, can be found here). Plath's thesis is one of those documents that garners continual interest. And, in 1989 it was published in a limited edition by the Embers Handpress in Wales, UK. Currently there are no copies available through book sites such as ABEbooks.com, thus proving it is a highly collectible book. There are 25 copies held in libraries around the world per WorldCat. However, you may be surprised and interested to know that copies of the original edition of 200 are still available from directly the Embers Handpress. I have emailed with Roy Watkins of the Embers Handpress and can say that he is a very fine, open man. In addition to Plath's The Magic Mirror, Embers has published two limited editions of short stories by Plath: A Day in June (1981) and The Green Rock (1982). These stories were printed in the expanded, first paperback edition of Faber's Johnny Panic and the Bible of Dreams (1979), but were excluded from the American publication and thus have never been in print in America. I recently asked Watkins how he and the Embers Handpress came to publish these texts. Waktins told me that has been "(now) almost a lifelong friend of the Hughes family - especially Ted's sister, Olwyn." Watkins says he "met her through Ted when he suggested that I send some things I'd written to her -she was acting as a literary agent then - and we became friends. When I started printing, Olwyn asked Ted to give us a little support. He was a great supporter of the small presses - almost as much as he supported young poets - and he gave us (gratis) the rights to the small editions we made of A Day in June and The Green Rock." About The Magic Mirror, Watkins says "Hughes felt that it would have to be published, but ... that it was not [something] Faber and Faber or some other major publisher would publish” and saw it as something that would be better in a small press edition." I could not agree more, especially having seen Smith College's copies of both Plath's original thesis and the Embers edition. Watkins continued, "So we took it on." The process of creating small books like A Day in June and The Green Rock is different to creating a 60-odd page monograph. Watkins said, "For such a small press (two of us - a little platen press - a few cases of type) it was a huge job...we couldn't possibly handle it from our resources, so we had the text set by Gloucester Typesetters - maybe the last letterpress service of its kind. I think they have gone now. But they were very good. Of course, that increased expenses. Everything else we've done was hand-set, mostly by Eve who is very quick. I do the title pages, layout, presswork and binding." Asked how copies of The Magic Mirror remained unsold where other Plath titles sold out, Watkins remarked "Amazon shortly thereafter published a Plath bibliography declaring that the book was out of print, rare, unavailable etc." In reality, "we had barely begun to sell the copies - all bound by hand. That was one of the elements that drove us to quit printing and go back to itinerant lecturing around the globe. I do feel bitter about Amazon - they truly wrecked us. It is only now, after all these years, that we can continue to sell the original copies because they have increased in value." Quantities of The Magic Mirror are limited and even though the price is higher than when originally published, this is probably the cheapest you are likely to find them for a long time. Unfortunately, Embers has no more copies of either The Green Rock or A Day in June...Copies of the limited editions of the two Plath short stories can be found via ABEbooks.com. If you are new to all this, a good place to start is on ABEbooks by reading "Collectible Sylvia Plath" by Beth Carswell. My deepest gratitude must be extended to Roy Watkins for his helpfulness and also to Olwyn Hughes for verifying some of the bibliographic & publication history information in this post. A recent change was made to Plath Profiles that involved the changing of the main url to the site. The old url http://www.iun.edu/~plath has been changed to http://www.iun.edu/~nwadmin/plath. Please update your bookmarks. If you do find a link out there with the old url, never fear it is automatically redirected to the main page. We apologize for any inconvenience and/or frustration that this may cause you. As far as this blog is concerned I have been working my way through old posts updating the url's which has been a tremendous waste of time. Other Plath Profiles matters... Volume 4 is just about set (waiting on last minute edits and such before we start putting it together). Updates will be provided here and maybe on Plath Profile's Facebook page as spring fades to summer and the days get deliciously shorter and fall into winter’s eager approach. We have updated, slightly, the submission guidelines based on some feedback and from have been burned a couple of times in the forthcoming issue. Also, we have posted an initial Call for Papers for Volume 5. Feedback welcome; other topics for papers are obviously welcome as well. I am going to be making some changes to the website and creating an "archives" folder that will contain older calls for papers, links to issues, etc. What else happened where Sylvia Plath wrote The Bell Jar? Sylvia Plath was mightily stoked that she got to live in the flat that formerly served as home to a young W. B. Yeats. But, did you know that another house that Plath "occupied" had a writerly association, as well. That was the house she borrowed in the spring and early summer of 1961 while she was writing The Bell Jar. Please see what I'm talking about and stop by Tracie Bylo Hitching's "Mad, Bad, and Dangerous to Know: The World of Byron Today." And many thanks to Tracie for making this association know to us! First, some kind of non-Plath business... I received the following in an email from the London Rare Book School. As I do go on about books and manuscripts & archives and special collections from time to time, this may be of interest to some of this blogs' readers. London Rare Books School will be running in two sessions from 27 June – 8 July, 2011. LRBS still has spaces available for some of its courses, notably 'Modern Literary Manuscripts', 'Reading, Writing & Sending Texts: 1400-1919' & 'Children’s Books: 1470-1980. For more details, see the LRBS website. Darling, Kristina Marie. Review of Lisa Narbeshuber's Confessing Cultures: Politics and the Self in the Poetry of Sylvia Plath. Rocky Mountain Review. Fall 2010: 242-244. Hoagwood, T. Review of Luke Ferretter’s Sylvia Plath’s Fiction: A Critical Study. Choice. April 2011: 1479. Trinidad, David. “From Ted Hughes’ List of Suggesting Writing Exercises for Sylvia Plath.” [poem]. American Poetry Review. May/June 2011: 41. 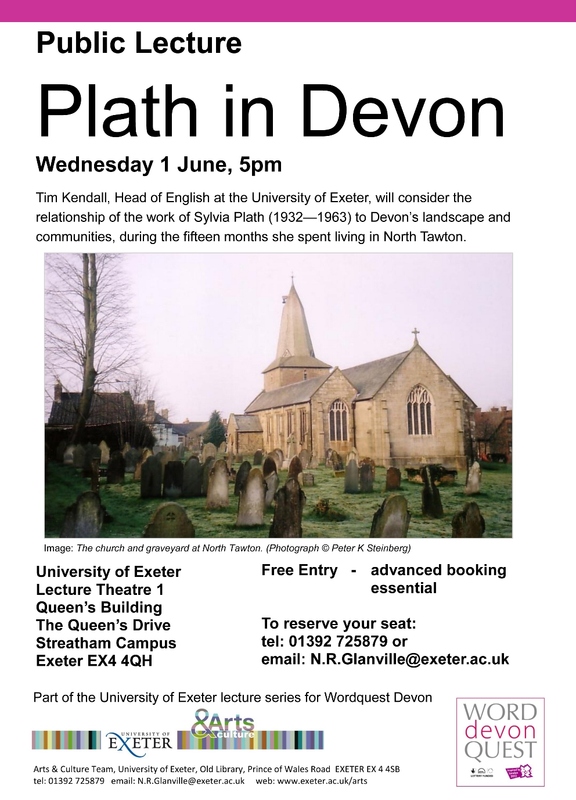 Tim Kendall, author of Sylvia Plath: A Critical Study, will be giving a talk on “Plath in Devon” at 5pm on 1 June in Lecture Theatre 1 of the Queen's Building, University of Exeter, Streatham Campus. Advanced booking is essential. To reserve your seat email N.R.Glanville@exeter.ac.uk or telephone 01392 725879. Stepanka Neumann's Sylvia Plath's Ambivalent Depictions of the Female Identity Poetry is an English translation of her originally titled Weibliche Identität und ihre literarischen Ausdrucksformen in den Werken von Sylvia Plath (Gender Studies - Interdisziplinäre Schriftenreihe zur Geschlechterforschung, Band 13 Hamburg 2009, 194 Seiten, ISBN 978-3-8300-4618-9). I have no idea how the German original title reads, but imagine it might read better than the translation, which I find awkward. For example, I typed in the German title into Google Translate and it returned "Female identity and Its Literary Expression in the Works of Sylvia Plath," which I think is a far more successful title than the one it was ultimately given. And so this is a problem with translation...But before anyone thinks I am being eine Hündin, let me say I appreciate having had the opportunity to read this title, which I feel does fill the authors' thesis which is to attempt "to examine how images of the female (and, necessarily, of its 'contrary', the male) are productively viewed, not simply as manifestations of a romantic will to express an 'authentic' self, but a a series of projections and displacements resulting from what Toni Saldivar terms the 'Gnostic' mode, whereby the imagination rejects all existing forms and metaphors as inadequate to the need for self-realization" (1). And, I appreciate that they translated it into English at all, thus opening up a market to a potential large readership. The book seems to directly battle Silvianne Blosser's A Poetics on Edge: The Poetry and Prose of Sylvia Plath while at the same time supporting and building upon Toni Salidvar's Sylvia Plath: Confessing the Fictive Self. Directly challenging Blosser and those other critics that read Plath and focus on the biographical elements within her writing, Neumann herself comes close adopting a biographical reading, particularly in her survey of "The Threatening Male in Plath's Poetry" (3.1.2), which examines "Event," "Burning the Letters," "Ode for Ted," and "The Other" among others. The danger here is that each of the poems is based either on biographical events and/or real people. No one can deny that Plath takes these occasions and does make art out of them, but to basically disapprove of critics who approach Plath's works from the biographical perspective and then to do it yourself leads this reviewer to have difficulty with aspects of the work. The translation and editing of this English version leaves a lot to be desired. Especially to one who is distracted and frustrated by typographical errors. One must be forgiving because this is a work in a secondary language (though I do wonder how it reads in the original and am a little envious of those that can read German because I feel like they will have the upper hand). Negative aspects aired, I liked this book and though only 79 pages (there are 98 pages of Plath's poems as an appendix) it is a good study and one that will provide value to Plath’s readers more interested in scholarly criticism than biographical considerations. As you know I am interested in Sylvia Plath books - both those written by her, about her, as well as those from either her personal library or those that she read. Frequently at book fairs I put on my horse blinders and scour stalls solely for Plath books. Anyway, I know people that collect Sylvia Plath books and very recently one of them started a new blog that highlight books in a terrifically, impressive growing Plath collection. Please go check out "A Piece of Plathery." Relatedly I think, the book seller Rick Gekoski recently posted "An Insider's Guide to Book Fairs" on the Guardian's blog. "How do you explain the allure of rare books? "You either feel it or you don't. It's a matter of taste, and inclination, and, like love, doesn't need to be justified. I think holding a copy of the first edition of Ulysses, or Great Expectations, is thrilling, especially with a presentation inscription by the author. If you don't feel similarly, you haven't got the makings of a book collector. In fact, I don't even think I would like you." Gekoski is no stranger to Plath books, as can be read in his chapter "The Colossus" in Nabokov's Butterfly (or, in the UK Tolkien's Gown). Read my review of his chapter on Plath here. Plath will be a hot topic for the next few years and I think the prices of her books will reflect the imminence of the 50th anniversary of the publication of The Bell Jar and her death in 2013; and then the 50th anniversary of composition of the Ariel poems in 2012 and their publication in 2015. Last October I totally dropped the ball (darn you, "Last Letter") in pointing out that it was the 50th anniversary of Plath's first published book. Thanks to Anonymous for being the only one to respond to the trivia questions. This was my second attempt at this (See the trivia 16 June 2008 and the answers on 29 June 2008) and both were relatively poorly received. Ho hum; seems like the “Did you know...” is a better way to go. 1. In the fall of 1954, during the first semester of her senior year at Smith College, which charitable activity did Sylvia Plath do? D. Read aloud to a dear old blind man. 2. To whom did she write of this activity? In a letter simply dated "Saturday" Plath asked id he mentioned this activity to him. She reported that she read aloud to the dear old blind man on Monday's. 3. How much money did Sylvia Plath lose playing roulette in Monte Carlo during her winter break from Cambridge in December 1955/January 1956? In a letter from January 21, 1956 to Gordon Lameyer, Plath recounts her continental excursions, admitting to the loss of funds. 4. Who did Sylvia Plath credit in a letter for the title of her poem “Circus in Three Rings”? In a letter dated simply "Thursday morning" (likely late November or early December 1954), Plath mentioned that her story "In the Mountains" and poem "Circus in Three Rings" had come out in the Smith Review, and does indeed mention "your great title" regarding the poem.